Cercidia prominens, I don't think so. 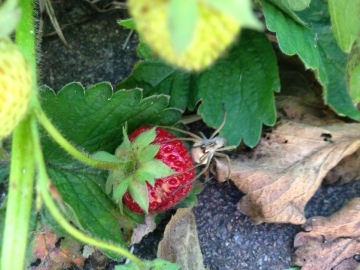 Compare to the photos of this spider on the Summary page. This is not Cercidia. Wrong habitat as well. Looks like Cercidia prominens to me. The front of the abdomen of Cercidia prominens is pointed and overhangs the cephalothorax as shown in the first of your images. The species is very reddish with a pale yellowish stripe on the abdomen. Not a species easy to find although it seems to be most 'regular' in my area on the West Sussex heaths and at Ashdown Forest. 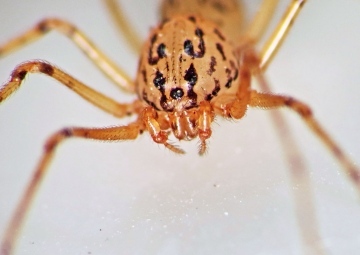 Yes,this looks like Steatoda nobilis, the so-called 'noble false widow'. 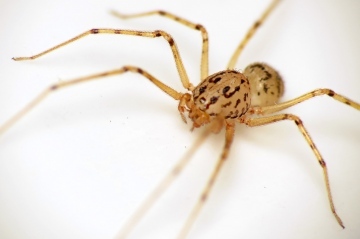 There are a number of 'false widows' in Britain, some which are native or have been in the country for centuries, so there is a lot of misinformation about these spiders. 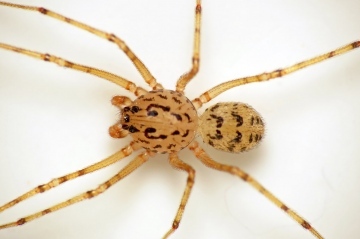 Steatoda nobilis is the spider which the media make such an unjustified fuss about. It has been frequent in the southern coastal counties of England for a very great many years, without causing any problems. It is nowadays frequent in many areas of southern England. The media frenzy caused by this spider is unwarranted and almost certainly all of the horror stories and pictures of injuries shown in the rags are not caused by any spider at all. 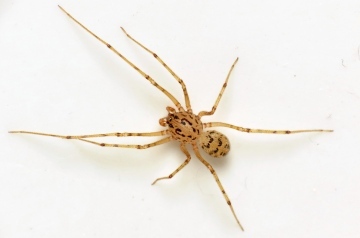 These spiders are unobtrusive, have no interest in attacking humans and would only bite if they were put into a position where they do so as a defensive reaction. Honey bees and social wasps pose a far greater risk. We seem to have Trogloneta granulum from South Wales as well, collected by Simon Warmingham on 23 March 2012 under woodland stones, which is in some material I was recently sent for id, and is how Richard has realised his spider is the same, but both these await confirmation by Peter Merrett. If confirmed this will be a new family to Britain. Hey Richard that is not fair. It is not even on the British list! At least not the one I have! Great find. Thanks Martin. Looks like an adult male. I don't see this nice spider often nowadays. Please add to recording scheme. Observed 16/17 June 2014 indoors (in the bath) upstairs in my house, and every night up to and including last night (20 June). OS grid ref: TM166450 This species has been appearing in the bath every year since 2012. It's possibly Hypsosinga (not sanguinea), although I think it is more likely to be a juvenile Araniella species, which are often reddish and very variable in pattern and colourr, superficially at least it looks more like Hypsosinga heri, not recorded in Britain since 1912! If the specimen doesn't exist or another one can't be found and identified under a microscope, we will never know! The habitat might make it possible........... Please go and find some more. I found this small, brightly-coloured, spider beside a footpath running alongside the River Wey on the RSPB reserve at Radipole Lake, Weymouth, on 28-May. The abdomen was no more than 5mm long and someone has suggested that it might be Hypsosinga sanguinea. Can anyone confirm this please? Re: Nursery web spider with egg case? Yes, this is a 'nursery web spider' Pisaura mirabilis. Can you please provide a full postcode or Ordnance Survey grid reference and date of the record so that your record can be added to the recording scheme. Nursery web spider with egg case? I took this pic today 18.06.14. Can you help me identify it?